For years now, Acura’s compact models haven’t had it very easy. From the EL to, more recently, the CSX, the manufacturer has received heavy criticism for offering a de facto luxury Civic, sticking the Acura logo on the hood and raising the price. But the same cannot be said for the ILX arriving this year. The automaker didn’t make the same mistakes, meaning that we finally get a luxury compact with its own unique DNA. Luxury brands offer on different configurations for their entry-level models. Audi, Mercedes-Benz and Lexus propose family cars with the A3, B-Class and CT, respectively. BMW, on the other hand, offers 1 Series coupe. As for Acura, like Buick with its Verano, they continue to believe that a sedan is the best choice. It’s true that this configuration has no real disadvantage, and it’s also unanimously popular in North America. Style-wise, right off the bat, the ILX sets itself apart from what we’ve seen in the past. It lines break radically with those of its little cousin, the Civic. It has a much more sophisticated personality that give the impression of luxury, which seems to be an absolute must when choosing a more prestigious logo. Its typical Acura grille means that you’ll recognize it easily from the front. In fact, from that angle, it looks a lot like the TSX. Its sportiness is accentuated and enhanced with its long hood and reduced overhangs. The 17-inch rims (16 in the base version) are also very nice. The tail end is not to be outdone and is similar to the manufacturer’s other luxury vehicles. Every effort was made to distance the ILX from the Civic and avoid comparisons. However, they have a very similar nomenclature, mainly due to the choice of engines. While the Civic comes factory standard with a 1.8-litre four-cylinder, the ILX gets a little more power (10 more horses) thanks to its 2.0-litre four-cylinder engine that develops 150 horsepower and 140 lbs.-ft. of torque. On the other hand, we wonder why it needs super gasoline and the increased price at the pump that comes along with it. This engine, which is appearing for the first time at Acura, is paired exclusively with a factory-standard five-speed automatic transmission. As is the case with the Civic Si, Acura decided to offer a version aimed at more enthusiastic drivers with the ILX Dynamic: a 2.4-litre four-cylinder that gives it 201 horsepower for a torque of 170 lbs.-ft. It comes with a six-speed manual gearbox that is exclusive to this version. I understand that this ILX is aimed at fans of a sporty ride, and its manual gearbox with its short gears and superior engine power does in fact greatly upgrade the pleasure of driving. Furthermore, the ILX Dynamic’s price is equal to or lower than the other more posh versions equipped with the base engine, thereby leaving you with an interesting dilemma: increased sportiness or superior equipment level? 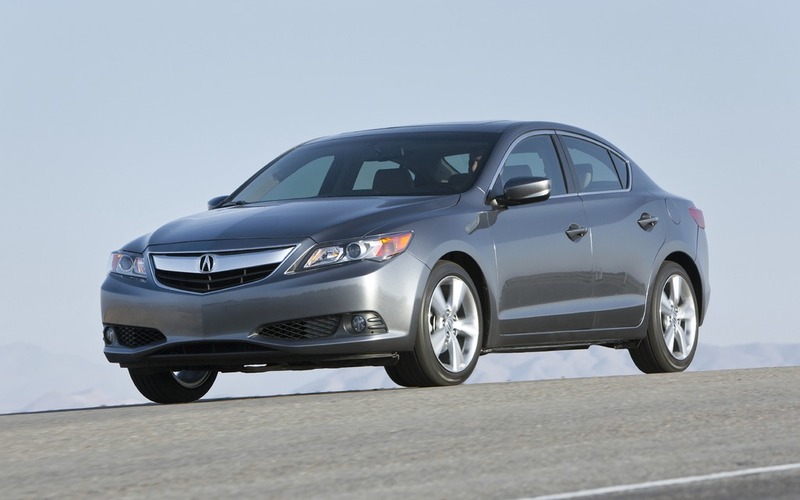 Finally, the ILX is also available in hybrid form – a first for the Acura division. It’s equipped with a 1.5-litre four-cylinder gas engine teamed up with an electric motor and a set of lithium-ion batteries as well as a continuously variable transmission. When you consider its $35,000 price tag and the already reasonable fuel consumption of the ordinary version, you’ll quickly understand why you won’t see many ILX hybrids on our roads. When you get inside the ILX, all the typical luxury car features are there: smooth materials, attention to detail, varied colour schemes and several hi-tech gadgets. We like the dashboard design, especially the beautiful and ergonomically-sound LED-lit dashboard. Everything’s where it should be and easy to understand. As is the case with the other Acura models, there are numerous controls, in particular on the central part of the dashboard. Fortunately, the climate control is separate from the multifunction system, which makes it easier to use. As for the on-board computer, sound system and car settings, prepare yourself to control them using the dial and display screen. It’s a shame, Acura has never been known for designing intuitive systems. In an era when touch screens are becoming the a must, it’s high time the manufacturer gets with the program. Otherwise, the ILX provides ample space and comfort for five people. All passengers, even tall ones, have a good deal of room even. At 50 litres, the cargo area suits the family’s needs, but the ILX’s rivals with their hatchback configuration offer more. This is the sedan’s main drawback. At the wheel, the ILX has a good driving position. The seat settings, the telescopic steering column and the comfortable steering wheel help set us at ease quickly. Of course, don’t expect a race car – the 150 horsepower of the 2.0-litre is sufficient, but you won’t exactly be pinned to your seat. Mercedes-Benz’s new B-Class with its 201 horsepower gives more while other rivals like the Audi A3 and BMW 1 Series are more engaging. On the other hand, the ILX is the leader when it comes to comfort on the road – surprisingly so, in fact. Its suspension offers a good compromise between firmness and comfort and you definitely won’t be afraid of long trips. Its chassis is quite rigid and is well supported by new dampers and the power steering gives you the impression of control. Basically, the handling is vastly different from that of the Civic. I must admit that we didn’t expect to be so taken with this new luxury compact. Acura seems to have finally managed to satisfy the desires of buyers. It’s nice-looking, fun to drive and, most importantly, its base price is lower than that of several rivals.